e an SEO copywriter. The pressure’s really on with this one because technically this is a piece of SEO copywriting so I’d better do a decent job! Firstly, let me explain why copywriting is central to search engine optimisation and indeed the majority of other search marketing disciplines. Essentially, copywriting is all about content creation. Traditionally in SEO the content on a webpage would be seen as a vessel that was used to contain as many ‘keywords’ as possible. Modern search engine optimisation has seen a minor revolution in the role that copywriters play, and now content is recognised as a fully-fledged marketing tool that can build brand awareness, cultivate customer loyalty and develop a link profile. So, the question is, do you need to be a Shakespeare, a Tolstoy, a Coetzee or an Atwood to write content worthy of search engine indexation? Thankfully not (although it will help if you can avoid the turgid prose that has made Stephanie Meyer millions!). Sure, you’ll need a half-decent vocabulary, a confident writing style and a capacity to comprehend technical detail, but more importantly, you’ll need passion, flair and the ability to entertain your readership. It might seem strange that the first key skill I discuss has nothing to do with technical SEO, but being able to write great content that is going to be enjoyed and shared by website visitors is arguably more important than writing content simply optimised for search engine indexation. Website content has several purposes, some of which I’ve discussed above – but it can really be split into two categories – ‘technical’ and ‘marketing’. • Regularly updated content will cause the search engines to crawl and index you’re a website more often. • Keywords in webpage content will help the search engines attach relevance and authority to a domain. • Links created (both internal and outbound) in webpage content can be used to build strong internal navigation that will help the search engines fully index your site. • Webpage content can be used to display a businesses passion and knowledge for their industry. • Webpage content can be used as a form of ‘reputation management’ for the reasons stated above. • Product descriptions and other forms of content on a website can be used as selling tools that improve conversion rates. • Webpage content can have personality and an individual flair that might otherwise get lost in corporate jargon and verbiage. Most modern businesses investing in SEO tend to focus more on the marketing properties of excellent SEO copywriting, partly because the technical aspects occur naturally when content is created, but also because it could potentially win them a healthier ROI. By having the ability to write for site visitors and not solely for the search engines, SEO copywriters will prove much more effective as marketers. As I’ve mentioned in the previous point, marketing is a big part of SEO copywriting, so if you are able to adopt the mind-set of a marketer when producing web copy then the content you write has the potential to be much more effective. It’s about understanding what makes a readership tick; understanding the psychology of the market you’re writing for, and using that knowledge to structure your own writing. This marketing mentality can help for two reasons. Firstly, if your readership feels that they connect with the blog or article you’ve written then they are much more likely to share that content with others. This can mean that it wins authority rich links from relevant sources, helping a company develop the link portfolio of their website and eventually that website is going to improve its ranking in the SERPs. This will generate more appropriate traffic from the search engines and is connected to the second point – conversion rate optimisation (CRO). CRO is about maximising the number of visitors that website into converting traffic. The on-page content can have a huge impact on CRO if it is written with marketing in mind. You might want to think about what would bring a visitor to that page – if it’s a product, why should they buy it, if it’s a service, why do they need it. Use this to write compelling material that will inspire users to make a purchase from the site you are writing for. I suppose this should be an obvious skill for SEO copywriting professionals, and it’s really connected to the broader general writing ability mentioned at the beginning of this blog. Being creative isn’t just about adding funny pictures or bright colours to a piece of content (although sometimes this can help! ); I would say it’s more about finding imaginative ways to add substance to writing and to engage your readers. Creativity also doesn’t have to stop with the production of content – inventive content marketing is crucial if an online community is to become aware of a piece of writing. An SEO copywriter should always be thinking about how they can give their content an edge over the attempts of competitors. It might be through the production of a detailed Infographic or through some accurate statistical research you have conducted to illustrate a point. Tiny embellishments and creative flourishes can elevate a piece of text from technical blandness to an engaging marketing tool. Any copywriters that have this ability would be coveted by many SEO agencies. 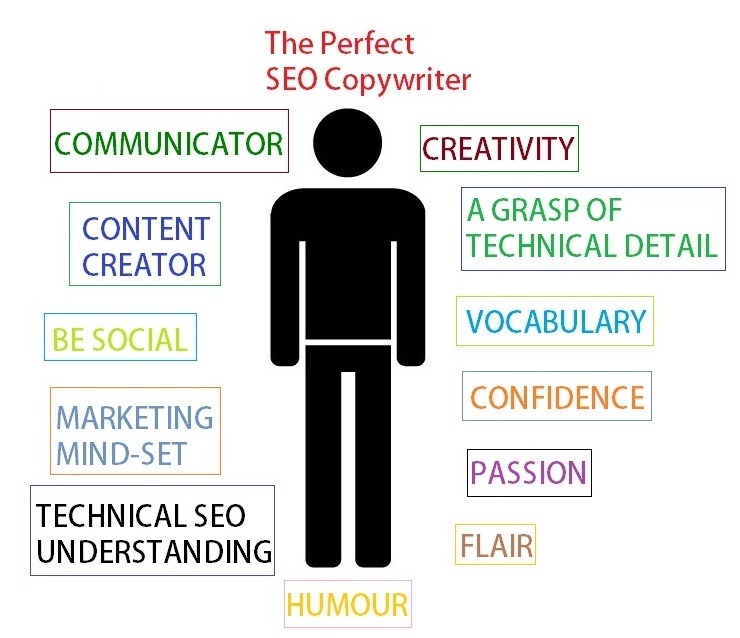 Are you an SEO Copywriter? re – I have mentioned only three from an entire range of abilities the complete copywriter should have. It does require a rudimentary understanding of the way search engines operate and how they index websites, but more emphasis should be placed on the ability to consistently create compelling, engaging content. What the visitor reads on a webpage often helps them form their opinion of that website and whether they return to it – so, it’s quite understandable that internet marketing agencies and clients place a lot of stock in copywriting services. If you have any other questions about any of our SEO services please don’t hesitate to get in touch via our website. Are you using Analytics to tell the right story?